Monies paid will be refunded only in respect of back issues and current subscriptions. 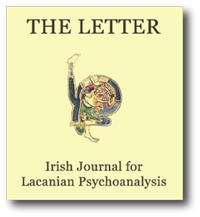 Prices include delivery of the printed version of The Letter by standard post or by courier if requested to the subscriber’s or orderer’s address, duty unpaid. Claims for non-receipt not due to change of address will be accepted up to six months of posting. The Editorial Board of The Letter does not transmit personal or financial details of subscribers to any third party unless required to do so by law.